Journey Into Asia is the annual cultural showcase that has been hosted on UNC’s campus by the Asian-American Students Association since 1992. It is currently the largest platform at UNC for Asian-American Pacific Islander students to express their identities and to showcase their cultural heritage through artistic performances. The theme for this year’s JIA is disORIENT, which derives from Edward Said’s scholarly concept of orientialism that was published in 1978. Said’s Orientalism is a critique of the West’s patronizing historical, cultural, and political perceptions of the East. Essentially, Orientalism implicitly fabricates a more developed, rational, superior Western society over the East. 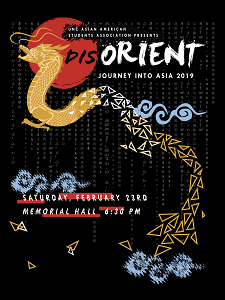 With the theme of disORIENT, the Journey Into Asia cultural showcase challenge the misrepresentation of the so-called “orient,” while aiming to empower members of the AAPI community, not only bring aware but also to advocate for AAPI stories, and celebrate the diverse unique cultures within Asia.